Having a hammer drill that has the ability to deliver the power necessary to drill into various materials is a must and â€“ believe me â€“ lintels and reinforced concrete will sort the good from the weaklings of the bunch. As hammer drills are usually used to drill holes into which something will be affixed, here are a few techniques and tips that will help with drilling and fixing. When drilling make sure that you are in a comfortable position, especially when working at height, and use a burping pressure method (see photo 1). To do this, drill about 25mm into the material, retract the drill and bit a few millimetres to remove the dust, and then re-drill for another 25mm and retract as before. This keeps the hole clean of debris and dust. Believe it or not, not all materials produce 'dry' dust. 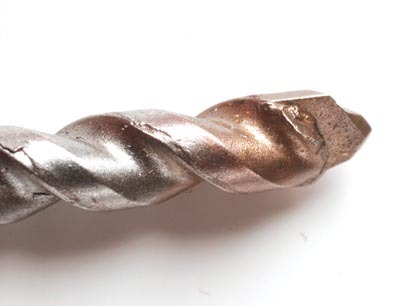 Some may be moist or sticky, can gum up in the hole, and may cause the drill bit to bind. Always wear eye protection and a dust mask. Materials can chip and be an eye hazard and fine masonry dust is a definite no to breathe in. Make sure that prior to drilling you have checked that there are no wires, cables or pipes in the wall in or near to where you are drilling that you may puncture. Masonry fixing plugs, usually just referred to as plugs, are placed in drilled holes when something is to be affixed to a wall. They can be made from various materials and come in a vast array of shapes, sizes and colours. The larger the plug diameter used, the larger the screw needed to fix into it, (see photo 4). They are all designed to be inverted into the hole drilled and to lock into it, thus providing a secure fixing to receive a screw. It is vital that the drill bit chosen is the correct size for the plug or it will be a sloppy fit in the hole and not work properly (see photo 5). The near right picture shows a drill bit matched in size to the plug used. When a correctly sized screw is screwed into a plug it expands in all directions to provide a physical expansion lock in the drilled hole. 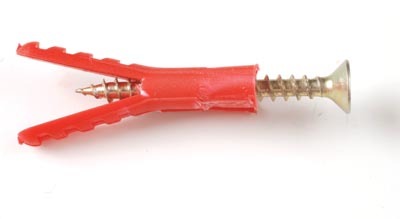 Use too small a screw in a plug and it will not expand. Use too big a one and it just chews up the plug and doesn't provide the lock. The pictures show how the screw will cause the plug to expand in all directions (see photos 6-7). 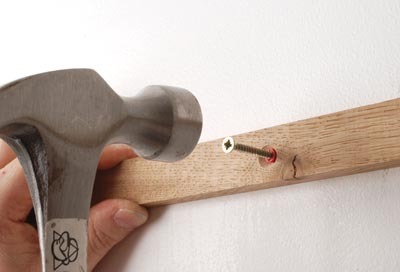 When drilling the hole in the wall make sure that you have measured the length of the fixing and how far it will project into the wall, then drill the hole 10mm or so longer than necessary. Although this won't affect the hold of the wall plug, or the screw, it is not best practice to have extra-long holes in walls and so on when they are not necessary. 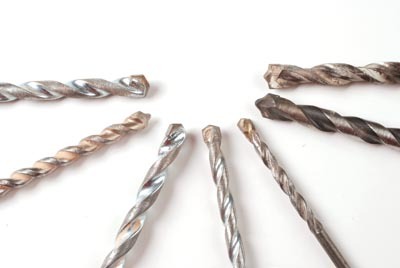 Hammer drills are designed for use on dense materials; however, with the dual action available, drilling timber, plasterboard and soft materials is a doddle. Just switch off the hammer action to normal drilling mode, fit the appropriate bit and use a suitable fixing. 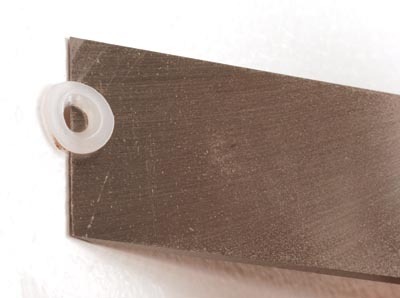 Some makes of plug have a lip on the outer rim which prevents the plug from being hammered in too far into the wall. This may, in some instances, prevent the work being affixed to the surface from sitting flush against it. This is not a good situation. Should you find this occurring, take a chisel and hammer and just remove the front face of the plug until it sits flush with the surface (see photo 8). Every so often it is not possible to mark the position of every screw hole to be drilled prior to fixing a piece of work. A hole may be in the wrong place or not provide a secure fixing for some reason or other. If you get stuck don't worry. 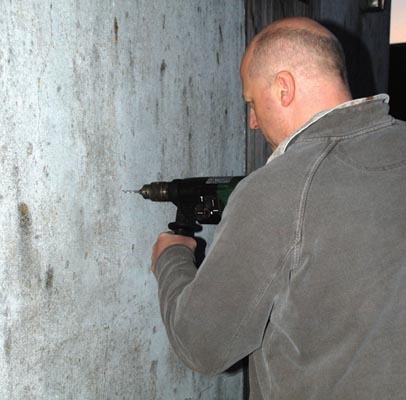 Drill the holes you can, fix the work and if you need an extra hole drilled, drill the work then use the hammer drill to drill the wall while the piece of work is affixed. Put the plug into the hole in the work, place in the end of the plug the screw being used to fix the item to the work, hammer the screw, plug into the drilled hole and tighten up the screw when the plug is fully engaged (see photo 9). of the hole and stop. 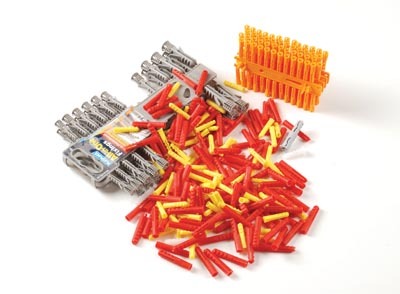 At this stage screw the remaining length of screw to provide a secure, tight fixing.